Auf dieser privaten Besichtigungstour durch Malaysias Hauptstadt entdecken Sie den Charme von Kuala Lumpur mit seiner Mischung aus Alt und Neu. Zu den Höhepunkten auf dieser privaten Stadtrundfahrt in Kuala Lumpur zählen unter anderem das Nationalmuseum, das Nationaldenkmal, die Nationalmoschee, der Kuala Lumpur Bahnhof und der Königspalast. Der letzte Stopp ist das königliche Besucherzentrum Selangor, wo Sie sich die Zinnschmiedekunst und das innovative Zinndesign ansehen. Contact was excellent to confirm pickup etc. David was an excellent guide and very considerate of my families capabilities during the tour. He was very knowledgeable and took us past twin towers with photo stops, ASEAN park and memorial etc. An excellent inrtoduction to this ever changing city with a wonderful guide. Thankyou. Really good tour with Hai, covering all the major sites. He was extremely knowledgeable and told us a lot that you wouldn't find in the travel books. Also adapted the tour to do some temples rather than the Royal Selangor factory. Sonny was a good guide and chauffeur. On time, courteous, helpful about getting the most of our stay in KL, and flexible in what we saw and did. Most of what we saw however, we were left to ourselves to make of what we would - with a guide book this was OK. But we were hoping for more hands-on guide experience as we have had in other parts of Asia. Bring a hand towel and bottle of water even for morning tour! Nice Chinese tour guide, Lau did a good job and competent driver for my private tour US145. there was some confusion and had to reconfirmed that I had booked a private not group tour for this high price. All group tours were booked for my 2 week stay? They accommodated. My wish to see batik being made biput I felt very pressured to buy in the retail store which made me depart with nothing. Best part of the tour for me was theRoyal Senegal pewter factory. Also, the van didn't have high enough windows to see and I would have liked to look around more while Lao was speaking. For my proposes, it was an overall good experience. Our guide was on time and our ship was a little late but he waited patiently for us. He took us to see all that we wanted and waited for us to do some shopping. I would highly recommend him. And again we thank him for showing us your wonderful city. Had a wonderful time and loved the Elephants. Not so many things to see. 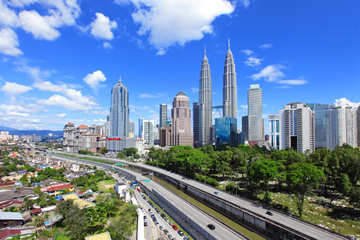 A good introduction to KL that sets the scene and allows you to get your bearings. Our guide was punctual, friendly and knowledgeable, he also made changes for our benefit. We added on the extra trip to the Batu Caves, as we hadn't booked this as the Viator web site claimed they were not visiting the caves due to the Hindu festival when actually the main part takes place in February - local knowledge matters! Visitors should note there is a compulsory government stop at a Batik factory - not very interesting. However, the Royal Selangor factory is interesting and worth seeing. We highly recommend this tour.